Solesmes has published the latest volume in the Paléographie Musicale series. This beautiful volume is the 23rd in the series which began in 1889 and is the first to be published in colour. 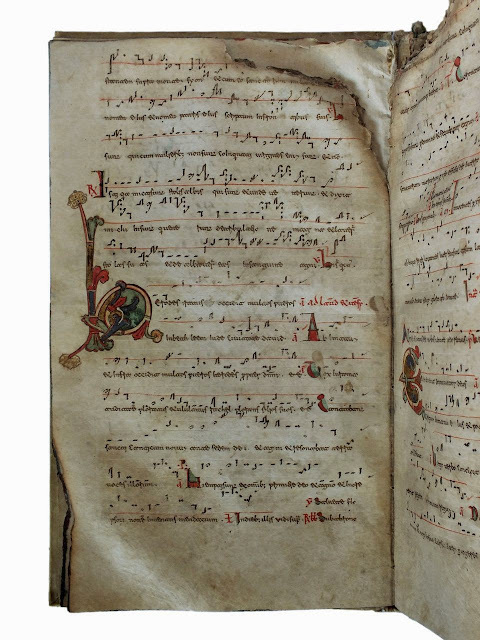 It is a facsimile of Montecassino MS 542, a 12th century antiphonary and a beautiful example of the distinctive Beneventan Chant which originated in the south of Italy. 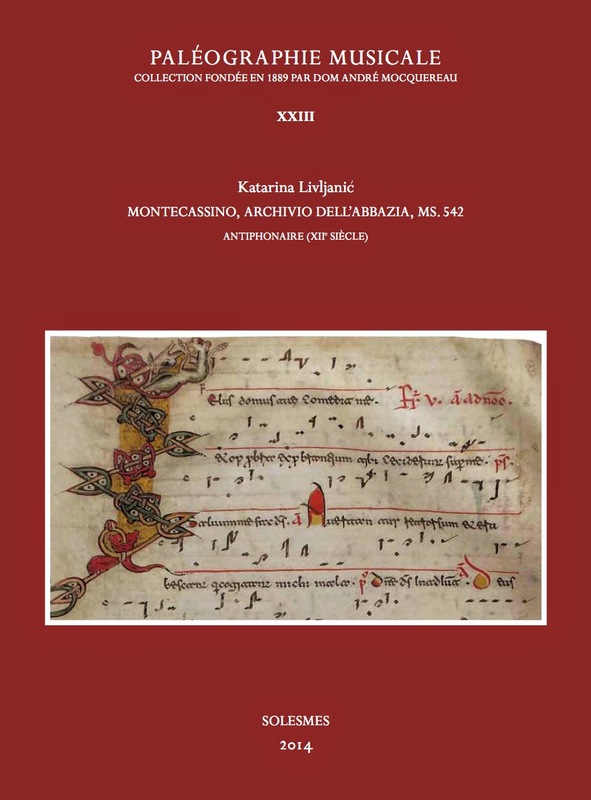 The book has an introduction and explanation (in French) of the notation by the scholar and musician Katarina Livljanić as well as a comprehensive index. The photograph below shows the original manuscript and the first antiphon from Lauds on the Feast of the Holy Innocents: Herodes iratus occidit multos pueros in Bethlehem Judae civitate David. The damage sustained in a fire can be seen at the top. The new edition can be purchased directly from Solesmes. The video of Solesmes below was recently filmed by a drone and shows parts of the monastery usually hidden out of sight. The opening shot starts in the French Garden, the Abbey Church visible to the right, and moves towards the Maurist Priory building which contains both the Atelier of the Paléographie Musicale as well as Dom Gueranger's cell, exactly as he left it. The charming garden of the smaller Maurist Cloister can be seen, as well as the Great Cloister, in the corner of which is the small building (with turret roof) where the Abbot washes the hands of guests before they enter the refectory. The Abbot's octagonal cell juts out at first floor level over a small internal courtyard (1:30) next to the library at the heart of the complex. The classic view of Solesmes which ends the short video is taken from a little further upstream on the River Sarthe. 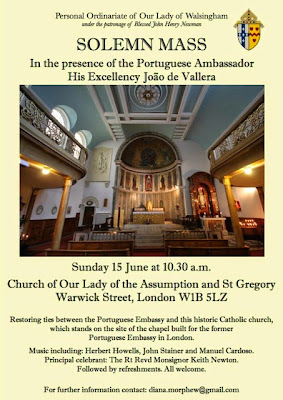 The Portuguese ambassador to the United Kingdom is to attend Mass at the Personal Ordinariate of Our Lady of Walsingham's central church in Warwick Street, Soho, London next month as part of efforts to restore historic links between that church and the Portuguese Embassy. His Excellency João de Vallera, along with other representatives from the Portuguese community in London, will be at the 10.30 a.m. Solemn Mass on Sunday 15 June, which falls at the end of a week of celebrations to mark Portugal's National Day on 10 June. The Warwick Street Catholic Church, Our Lady of the Assumption and St. Gregory, which Cardinal Vincent Nichols dedicated to the life of the Ordinariate in 2013, was built on the site of a Catholic chapel which had served the Portuguese embassy in London in the early eighteenth century, when the embassy was located in Golden Square, Soho. That original chapel, built during the Marques de Pombal's term as ambassador from 1724 to 1747 (and subsequently leased to the Bavarian Embassy), was badly damaged during the anti-Catholic Gordon Riots of 1780. It was rebuilt in 1789-90. The Mass will include music by the Portuguese composer, Manuel Cardoso alongside pieces by English composers including Herbert Howells and John Stainer, and will be celebrated according to the Ordinariate Use. The principal celebrant will be the Ordinary of the Personal Ordinariate of Our Lady of Walsingham, the Rt Revd Monsignor Keith Newton. This will be followed by a reception for all at which Portuguese wine and canapes will be served. Mass is at 10.30 a.m. Sunday 15 June. Church of Our Lady of the Assumption and St Gregory, Warwick Street, London, W1B 5LZ. All are welcome. For any who are interested, here are the contact details for three residential summer schools that offer instruction in painting illuminations in the style of the gothic Masters of the School of St Albans (which flourish in the 13th century England). I am the teacher at each. 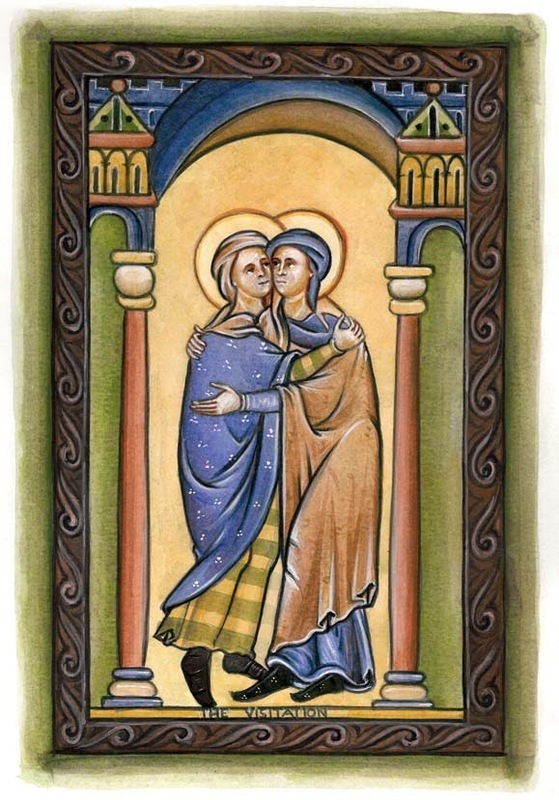 In this week of the Feast of the Visitation, as an example I offer a modern illumination in this style. All come in at under $600. Although each is taught as a class in which we work together, each class is taught so that each person gets a high level of individual attention and personalized instruction. This allows everyone work at his own pace and level. Each course will be suitable therefore, both for beginners and the more experienced. If you have already done one of these courses this will be for building on what you already know - you will be able to choose your own image and will benefit from more instruction. Students will learn the traditional technique of egg tempera. At all three, I will teach people also how to pray with visual imagery (a lot more straightforward than many imagine) and explain how to set up an icon or image corner as a focus of prayer in your home (as described in the book, The Little Oratory). 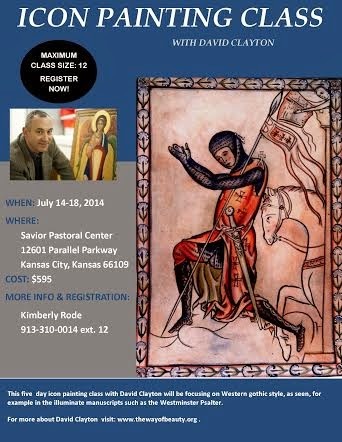 At the courses in Kansas and at Thomas More College the singing of the Divine Office will run through the course, so people who wish to will have a chance not only to sing the psalms, but potentially also learn to do so at a level that they can start doing it at home or parish - perhaps in front of your own icon corner. The icon class at Thomas More College coincides with a lecture series the college is presenting that features myself, NLM's own Matthew Alderman, the founder and director of the Catholic Artist's Society Kevin Collins, the well known sculptor Andrew Wilson Smith and finally, but not least, Dr Ryan Topping the author of Rebuilding Catholic Culture. 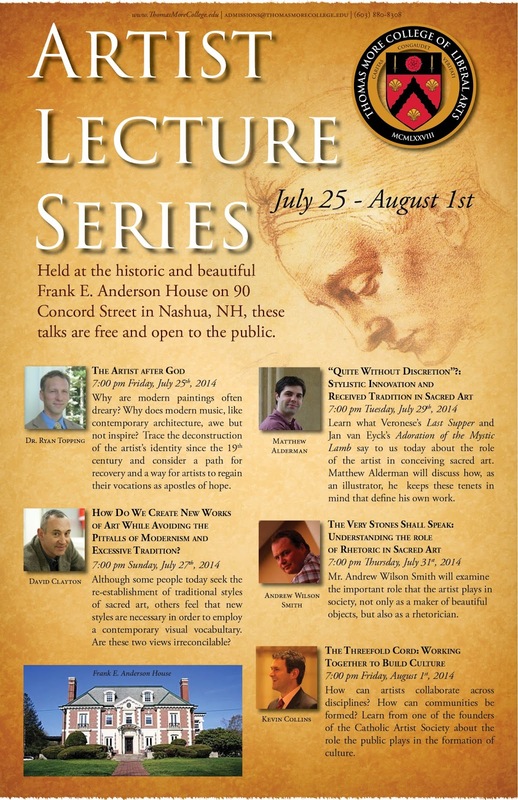 All lectures are open to the public and free to attend. 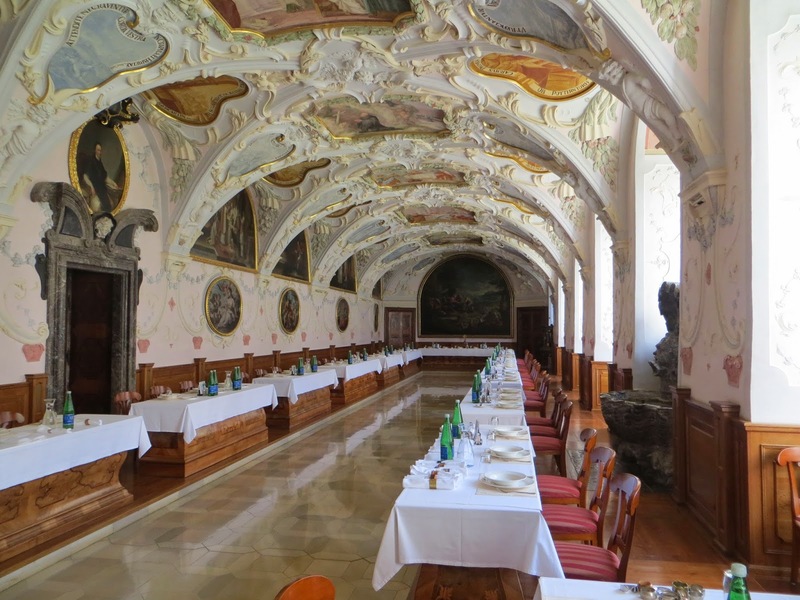 Last week, I enjoyed the tremendous blessing of a brief visit to the great Monastero di San Benedetto in Norcia, at the birthplace of Saints Benedict and Scholastica. 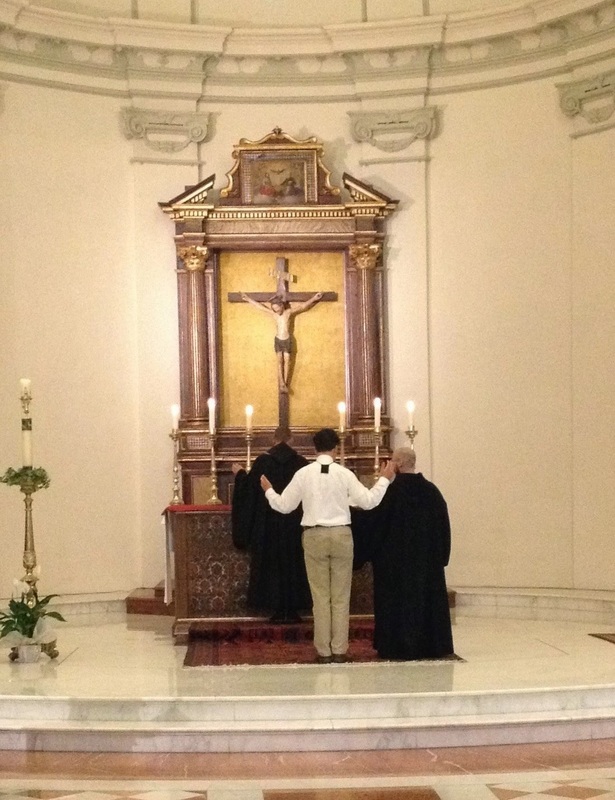 I was in Austria giving a course on the theology of sacred music at the International Theological Institute, and, as I had long wished to make my final oblation as a Benedictine oblate of Norcia, it seemed the right time to do so. This post really is nothing more than a series of notes and pictures; perhaps on a later occasion I will have the chance to share some liturgical reflections that occurred to me during my stay with the monks. The first thing that caught my attention, upon entering the basilica, was a side altar in honor of St. Peter Celestine. I had noticed the altar on previous visits but this time it really struck me, both because the abdication of Pope Benedict XVI tends to sharpen one's attention to his distant predecessor, and because the week before, on Sunday, May 18, when I happened to be dining in the refectory of the Cistercian abbey of Heiligenkreuz near Vienna, I heard the lector reading the Martyrology entry for St. Peter Celestine, which made me aware of his feastday on Monday, May 19. Another thing I was pleased to see was the subtle and powerful transformation of the sanctuary of Norcia thanks to the addition of an historic altarpiece, free-standing altar, and matching ambo. For many years, the sanctuary had a rather modern altar and a crucifix against the back wall, which did not have sufficient presence and beauty to focus the attention upon the center of the sanctuary. I'm afraid I don't have a very good photo of the "before" status -- this one was taken years ago with a poor camera. 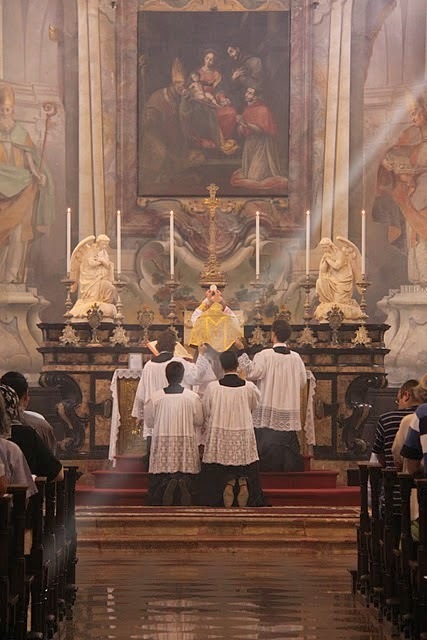 Thursday, May 22, was the feast of St. Rita in the Diocese of Spoleto-Norcia, and I felt very fortunate to be there for the conventual High Mass of the community, because these propers are seldom used in traditional Catholic communities in the United States -- the general calendar of the usus antiquior does not include St. Rita, who, it would appear, was remembered only in certain dioceses or communities. In the Baronius Missal that the monks had left in the guest house, I found the propers for St. Rita on page 2087, which states: "May 22, Los Angeles, ST. RITA OF CASCIA, Widow." 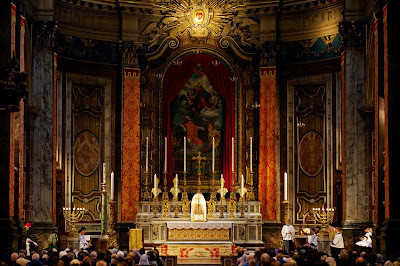 As the texts of this Mass are particularly beautiful, I offer here a few of them. COLLECT. O God, Who didst vouchsafe to confer on St. Rita so great grace that she loved her enemies and bore in her heart and on her brow the stigmata of Thy love and passion, grant us, we beseech Thee, by her intercession and merits, so to spare our enemies and to meditate on the pains of Thy passion that we may obtain the rewards promised to the meek and to them that mourn. Who livest and reignest. The EPISTLE was from the Canticle of Canticles, 2:1-13: "I am the flower of the field, and the lily of the valleys..." It's always a delight to encounter a liturgical reading from this most sublime and mystical book of Scripture, more commented on than any other book and yet so rare in the liturgy itself (less rare in the traditional, but almost non-existent in the modern Roman rite). Hearing the Song of Songs chanted by one of the monks truly gave wings to these already intense words. OFFERTORY (Gen 40:9-10). I saw before me a vine, on which were three branches which by little and little sent out buds, and after the blossoms brought forth ripe grapes. Alleluia. SECRET. 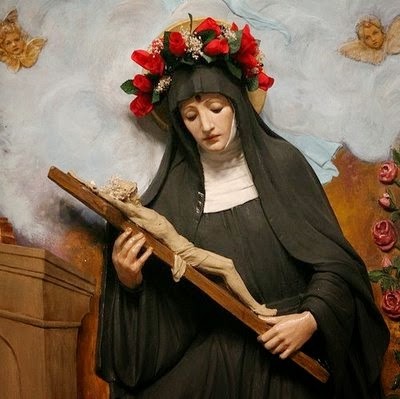 Pierce our hearts, we beseech Thee, O Lord, by the merits of St. Rita, with the thorn of that sorrow which is from heaven, so that, being delivered by Thy grace from all sins, we may be able to offer to Thee the sacrifice of praise with pure hearts. Through our Lord. COMMUNION. Thou hast prevented her, O Lord, with blessings of sweetness: Thou hast set on her head a crown of precious stones. Alleluia. POSTCOMMUNION. Regaled with heavenly delights, O Lord, we humbly entreat Thee that, by the intercession of St. Rita, we may bear in our souls the marks of Thy charity and Thy passion, and constantly enjoy the fruit of perpetual peace. Through our Lord. The town of Cascia is a close neighbor to Norcia, so not surprisingly May 22nd is a huge celebration over there and throughout the region. Immediately after Vespers on this feastday, Fr. Cassian Folsom, Prior of the community, received me as an oblate of the monastery in the presence of the other monks. 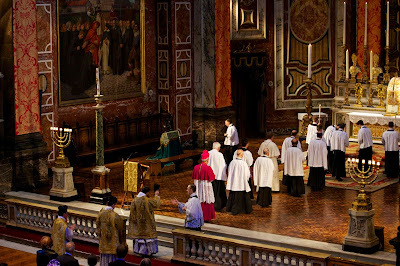 The ceremony was short, solemn, and beautiful, culminating in the reading of the hand-written oblate chart, the signing of it upon the altar, and the chanting of the "Suscipe" together with all the monks. Then there is the time for rejoicing! As many NLM readers know, the monks of Norcia are famous for their home-brewed Belgian-style beer, Birra Nursia, which has become so popular in their region that they can hardly brew enough to supply the demand. Br. Francis, the brewmaster, gave me a tour of the brewery, which had expanded considerably since my last visit. One last highlight of the visit was hiking up into the mountains to see the ruined monastery that the monks of Norcia often flee to in the summertime for peace, quiet, and a bit of coolness -- a sort of earthly image of the locus refrigerii, lucis, et pacis. The regional government of Umbria has given the monks a grant of 400,000 Euros to continue the repair work on this beautiful structure, located in such a splendid spot, but of course it will cost a lot more, and take many years, to bring these buildings back into regular use. The monks have chanted parts of the Divine Office in the chapel here. May the Lord continue to bless the good monks of Norcia, whose warm hospitality is rivaled only by their edifying devotion to the Work of God, the sacred liturgy. Today is the last day of Pascha for Christians of the Byzantine tradition. Each major feast on the Church calendar has an Apodosis that comes, normally, at the end of the octave. The hymns for Matins, the hours, Vespers, Compline, and the Divine Liturgy are repeated as on the first day of the feast. 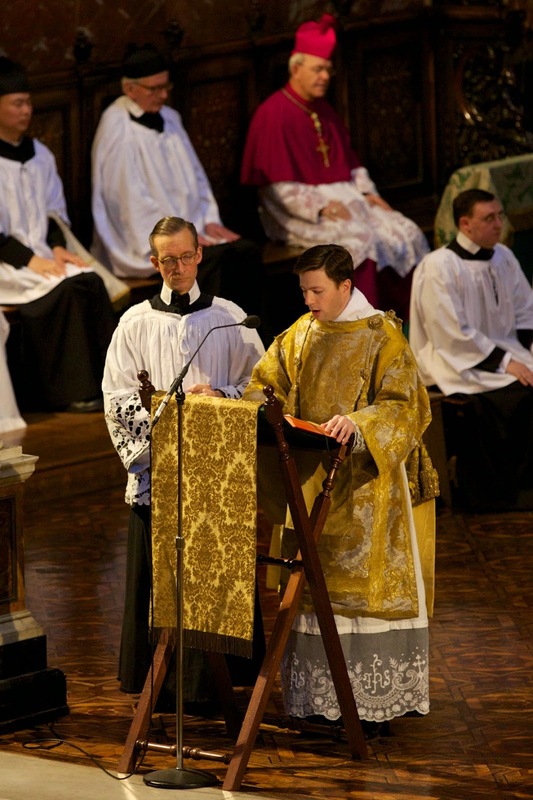 For Pascha, however, the Leave-Taking is on the vigil of the Ascension, but, with the exception of the changed lectionary, the services are the same as for Easter Sunday. Every major feast has its Apodosis. Why? The main reason is that the Church once again gives us the opportunity to celebrate the beauty of the feast. When we see or experience something beautiful, it is human nature to desire to have that experience again. When we taste delicious food, we desire to eat it again. The feasts of Christ and the Theotokos are a sweetness to the soul which arouses the desire to celebrate more than once. I have found this to be true in my own experience. 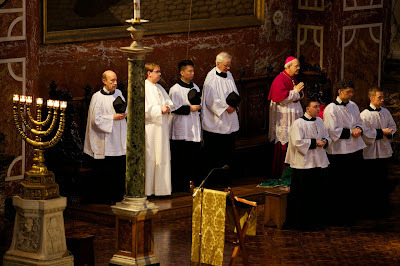 The beauty and richness of the Paschal Canon and the Paschal Stichera, the joy of the chants on Sunday morning are so marvelous that I am thrilled to repeat them every day of the first Bright week, and then repeat echoes of them each Sunday of the Easter season. But there is a special delight on this day of Pascha in being able to re-pray all of the services one last time, forty days later. It is like an anniversary party for a happily married couple, hosted at the same site as the original celebration. At the same time, in every remembrance there is a sense of incompleteness, a yearning for a future that more perfectly embodies that original greatness. And so today, the Apodosis is on a Wednesday, a fast day. For those who observe the fasting rules in all their rigour, ordinarily today would be no meat, dairy, fish, wine or oil. But every Wednesday and Friday of Pascha are allowed wine and oil, and today fish is allowed as well. But even for those keeping a more minimal fasting observance, today is a meatless Easter. We sing the hymns, but our fasting reminds us that it is not Pascha Sunday, and we are at the beginning of the end of this feast of feasts. After today's end, we cease chanting the Paschal hymns. The canon, the stichera, even the ubiquitous tropar: Christ is Risen... all come to an end. Today, is the last day to rejoice in the pure Paschal joy in the presence of the Risen Lord before his Ascension. 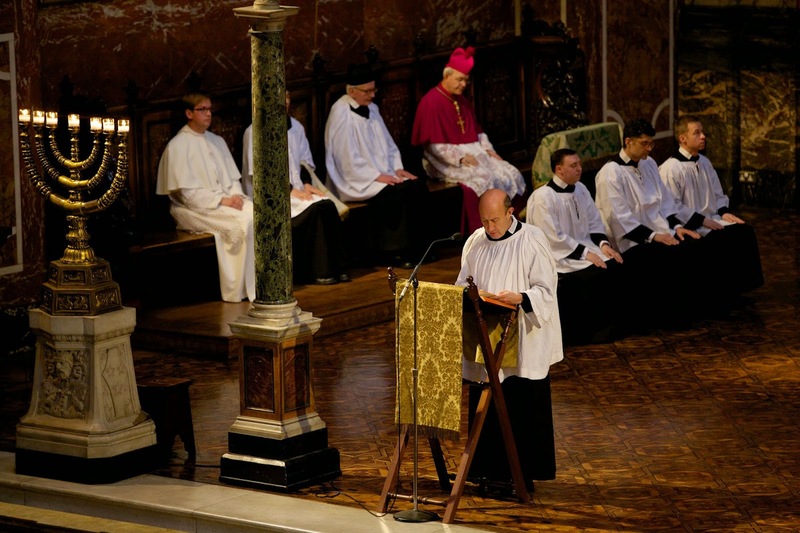 For the next nine days there is a kind of silence hovering over the Church's liturgy. There is still a certain pascal joy and expectation for Pentecost; for example we still do not kneel...but there is an air of waiting, of not quite full Paschal joy... But for today, sing your heart out! It is the last chance till next year. To help you, here is a link with the Paschal Tropar chanted in different melodies and languages: Christ is Risen from the dead, trampling down death by death, and to those in the tombs, granting life. 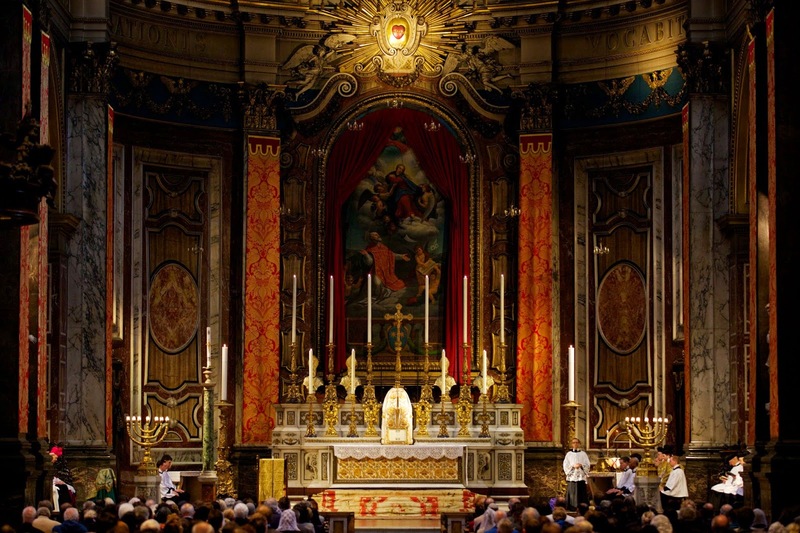 There will be a Procession of the Blessed Sacrament on the Solemnity of Corpus Christi, Sunday 22 June in London which is being organised jointly by the Parishes of Spanish Place and Farm Street. It is hoped that the Procession will become an annual event. 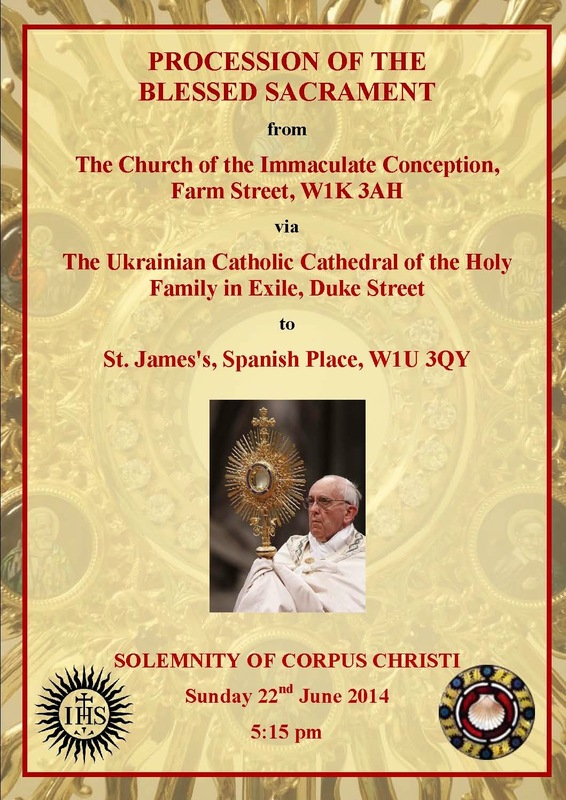 The Procession will begin at the Immaculate Conception, Farm Street at 5:15pm, walking via the Ukrainian Cathedral on Duke Street, over Oxford Street and past Selfridges to St James's, Spanish Place, concluding around 6:30pm with Solemn Benediction. My sincerest apologies for delaying in this post. 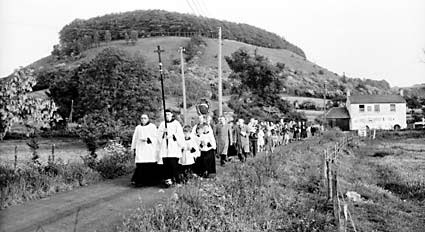 Nevertheless, if any readers took pictures of their processions and/or Masses during these Rogation days we currently are in (for those who attend the EF or follow the 1962 calendar), please submit them for inclusion in our photopost! Also, with Ascension coming up, we will also be accepting photos for an Ascension photopost. As always, please submit to: photopost@newliturgicalmovement.org and please place either "Rogation" or "Ascension," respectively, in the subject. This is a wonderful new resource for the Mass in the vernacular...and perhaps the EF too? Adam Bartlett is the composer who created the Simple English Propers that have been featured on this site regularly and I am an enthusiast of his past work. 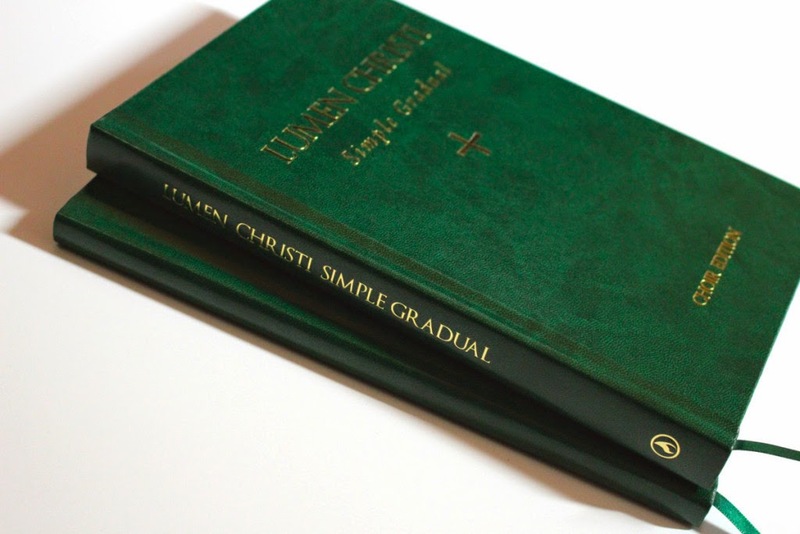 I was pleased to learn, therefore, that he had produced a new set of chant propers and to receive a copy of the new Lumen Christi Simple Gradual recently. 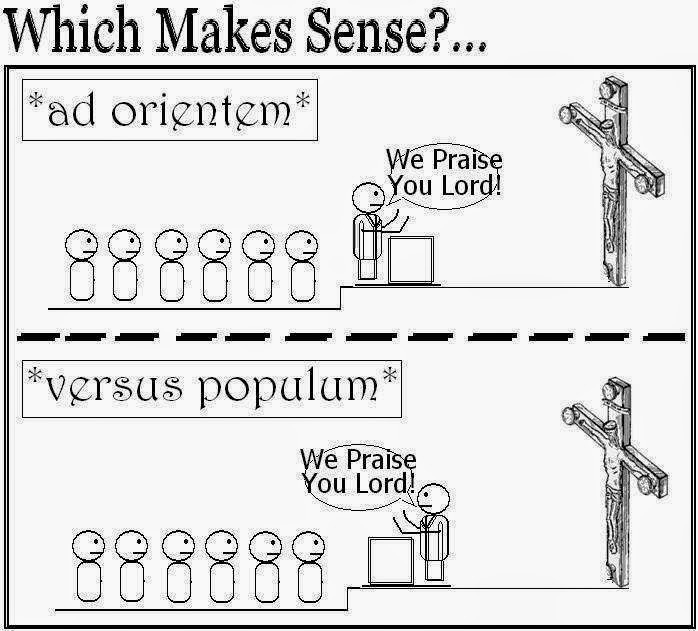 The second has eighteen Mass settings - most of which are the commonly sung gregorian Masses in Latin covering the main seasons and feasts of the year. 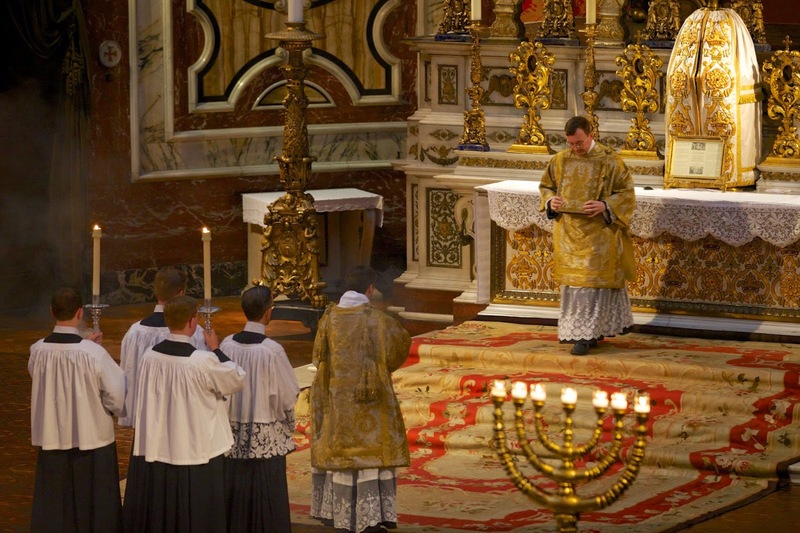 There are four English chant Masses, the first is the ICEL Mass, there are two composed by Bartlett and one by his mentor Columba Kelly. This inclusion of the Latin chants is consistent with the mission of not only producing something that is good in itself for English, but something that is derived from and points to the greater tradition of chant of the Church. 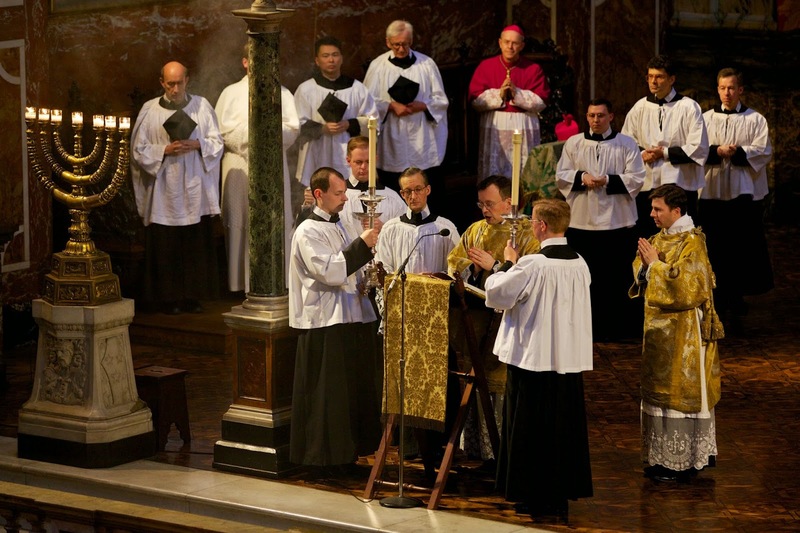 My hope for the future is that we see a true flowering both of the vernacular liturgy and the traditional Latin. 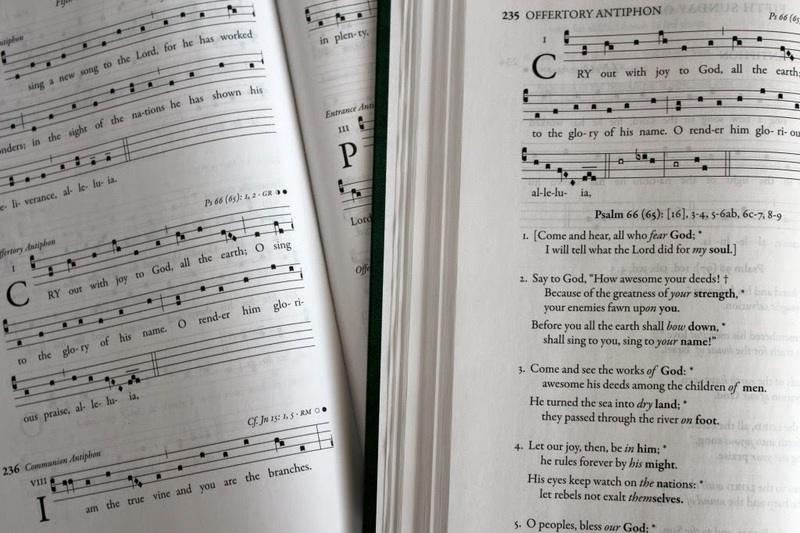 The third section is a set of propers, more complex than the Simple English, for the complete liturgical year - Introit, Offertory and Communion antiphons, with psalm meditations. There is also a very well written introduction in which Bartlett explains the reasons for the production of the book and gives very helpful suggestions as to how to sing the chants for those with relatively little experience; and practical ways to introduce them gradually in congregations that might have had no exposure to chant at all. In the end, the test of quality of this music will be time. 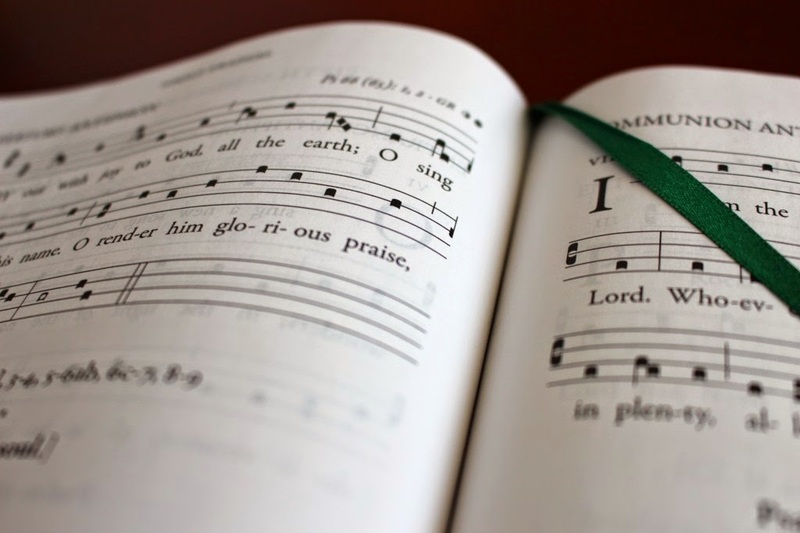 If the music it contains is beautiful enough then congregations and choirs will want to sing it, and if it is simple enough for them to do so, they will. I can only give my personal sense so far in this regard, but for what it is worth, I think Bartlett has hit the mark here. I have had a chance to sing some of the propers in a Mass. The response of my choir and the congregation where was sang it has been positive so far. 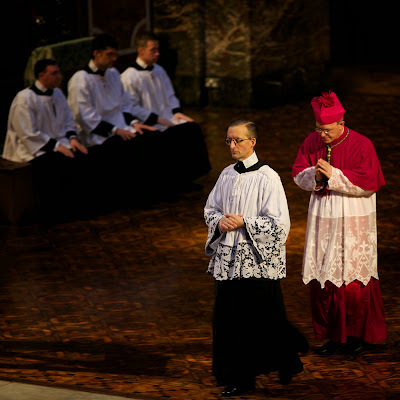 I sing in a choir run by my friend Tom Larson, which he calls his Catholic Basics Choir. We are a choir of adults and children from our families and most of us had little experience in singing chant before they joined the choir. Until recently, we have had a program of singing the Simple English Propers and then the Latin gregorian. Our experience of this has been very good. The SEPs are easy to learn, allow for a clear articulation of the text so that the congregations can understand it, and are modal so that they connect musically to the gregorian which follows in Latin. 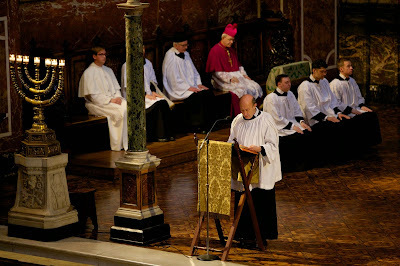 Doing it in this way, we found that congregations are introduced to the Latin in such a way that they are less likely to feel intimidated by being presented with text they don't understand, and instead meditate on the English they have just heard, while listening to the gregorian. Recently we have been singing these new propers. Compared to SEPs they are a step up in both complexity and beauty. They retain the advantages of the SEPs, they are still easier to learn than the gregorian if you have not done chant before; and the melodies fit the text very naturally and easily allowing for clear articulation. In these new propers I was struck particularly by how the examples we sang anticipated the gregorian proper, not just by being in the same mode but also by using echoes of the patterns of the melody in the gregorian chant. In our case it is 'anticipated' because we learn and sing the English first. I mentioned this to Tom afterwards and he agreed. He put it like this: these are perhaps 25% more difficult to sing, but the return on the effort in terms of beauty is much more than that. 'He has nailed it with these! ' he said. Tom is not easily impressed and has been a proponent of Latin chant for years. He actually said to me that for the first time, if he went somewhere and they only did English, if they did these chants he would be happy. There is an even greater endorsement, and that is to see our soprano section, average age 7, singing both the English and then the gregorian Latin and picking them up very quickly under Tom's guidance with the help of these chants; and enjoying it! St Augustine famously said (in his commentary on Psalm 32) that the beauty of the music can communicate a truth that words alone cannot. This is only true when the melody is of the highest calibre and when music and text are in harmony. I dare to suggest based upon my experience of these so far that these propers do this. There is as sense that the melody itself is an interpretation and illumination of the meanings of the words. 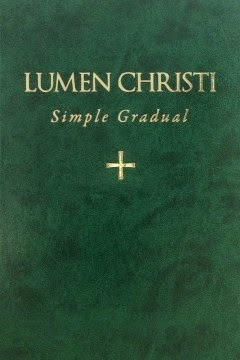 You can purchase the Lumen Christi Simple Gradual here. The Naples Oratory was founded in 1586 by three disciples of St. Philip Neri, Antonio Talpa, Giovanni Giovenale Ancina (later bishop of Saluzzo, beatified in 1889) and Francesco Maria Tarugi (later cardinal), only 11 years after the Congregation of the Oratory was officially approved by Pope Gregory XIII. It was the Congregation’s first house outside of Rome, and since the founders came from the church where St Philip lived, San Girolamo della Carità, the Neapolitans have always called them the “Girolamini”. (“Girolamo” is Italian for “Jerome.”) It was immediately a tremendous success, and for centuries one of the most important religious institutions in Naples; the complex of buildings (including a huge church, two cloisters, one of which is also very large, and several smaller oratories) occupies a full hectare of land right in the middle of the city, across the street from the Cathedral. In its heyday, it was patronized by most of the important families in the city, which was then the capital of a large independent kingdom; it became famous for its art collection and magnificent sacristy. Like many of the great cultural and religious institutions of the former Kingdom of Naples, the Oratory has suffered much from various acts of suppression and confiscation; the center of Naples was also bombed during World War II, and a part of the complex which was damaged, the Oratory of the Assumption, is still in need of restoration over 70 years later. Nevertheless, the Girolamini remains one of the great monuments of St Philip’s apostolic labors, and those of his sons throughout the world. The façade of the church, seen from the via dei Tribunali, the ancient decumanus maximus of Naples in Roman times. The central nave seen from the door. The coffered ceiling (partly missing) with an image of St. Philip. The right side-aisle. As in many Italian Counter-Reformation churches, the side-aisles are deliberately arranged as a kind of blind that separates the side chapels from the central nave, so that the faithful would not be distracted from the principal ceremony at the main altar. A side altar dedicated to St Charles Borromeo. 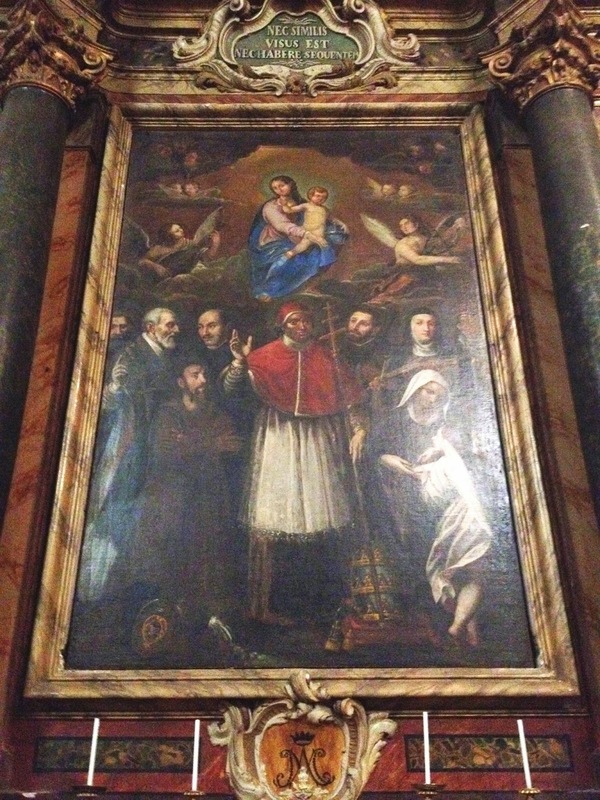 St Philip and St Charles knew each other personally, and the latter made generous donations towards the building of the Chiesa Nuova, the Oratory of Rome; they are pictured together in the altarpiece. In the statue, St Philip is shown trampling on a cardinal’s hat, a symbol of the many ecclesiastical dignities offered him, and always refused. The two busts on either side may be Ss. Cosmas and Damian, since a church named for them was pulled down to make way for the Girolamini; when this was done in the Counter-Reformation period , it was often on such terms that the new foundation was required to preserve devotion to the titular saints of the old one. The main side-altar of the left transept contains relics of St Ignatius of Antioch, and the Roman martyrs Ss. Nereus and Achilleus. Another disciple of St Philip, the renowned historian Cesare Baronius, was made cardinal of the church of Ss Nereus and Achilleus in 1596, and presumably donated these relics. (It was Baronius who read the commendation prayers for St Philip as he lay dying.) I have never before seen a sepulcher in an altar decorated like this. The small cloister though which one now enters the church, with the dome above. The dome of the chuch seen from the great cloister. The façade of the cathedral, seen from the former buildings of the community. On the right side of the Duomo is the large chapel of Naples’ Patron Saint, Januarius (San Gennaro), the relic of whose blood famously liquifies on his three feast days. The chapel houses over 40 silver busts of various Saints, including this one of St. Philip; these are often carried in procession though the heart of the city by various confraternities on the three feasts. 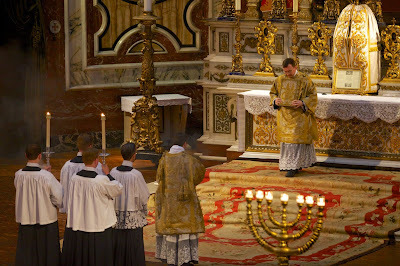 High Mass was celebrated at the London Oratory this evening for the Feast of St Philip Neri. 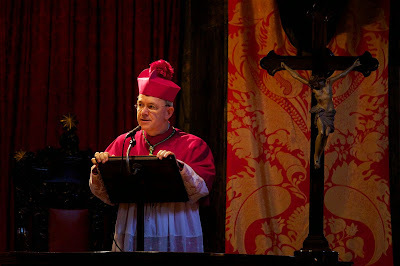 The Preacher was Bishop Athanasius Schneider, Auxiliary Bishop of Astana, Kazakstan, Titular Bishop of Celerina. The Choir of the London Oratory sang the Mariazellermesse by Haydn and Pangamus Nerio by Wingham. Happy Feast to Oratorians everywhere!